On July 30, 2018, Utica, New York Mayor Robert Palmieri announced that the City of Utica, in partnership with the Utica Industrial Development Agency, had issued a Request for Proposals (RFP) for the purchase and redevelopment of the Utica Historic Marina located at 16 Harbor Lock Road. 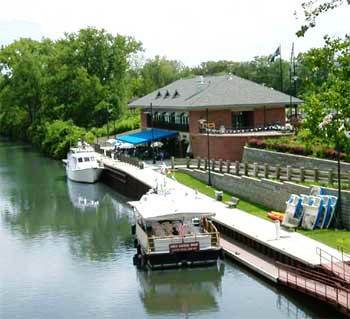 The city-owned building at the marina was constructed in 2001 on property leased by the City from the NYS Canal Corporation. Seeing an opportunity for economic development, Mayor Palmieri worked with the Canal Corporation and other State partners to inquire about selling the land to the city thereby allowing the building and the land to be sold together. The building is 8,000 square feet in size, is comprised of two levels and currently home to Aqua Vino restaurant. The offered purchase price will be taken into consideration, as well as, the financial capability of each bidder, their short- and long-range vision for the property and the ability of each bidder to implement that vision. Proposals are due by 3:00 pm on Thursday, September 6, 2018 to J. Michael Mahoney, Secretary to the City of Utica Board of Contract & Supply. Photo courtesy of the City Of Utica.